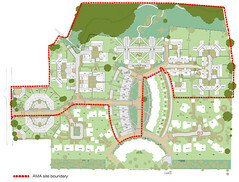 The development is a joint venture between Bryant Homes and AMA (New Town) Ltd on the site of the former Dunfermline College of Education on the outskirts of Edinburgh. 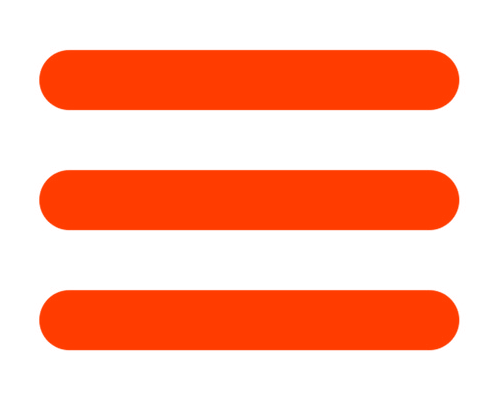 We are responsible for the AMA section of the development. The site is bounded by existing housing, woodland and a designated archeological site to the north, by the historic tree lined avenue to Cramond House, and by playing fields to the south. 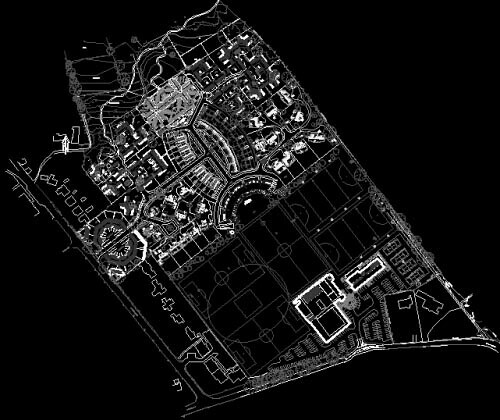 The development consists of both urban and suburban elements: the urban elements being a central crescent reaching to 3.5 storeys and two flatted developments also of 3.5 storeys. 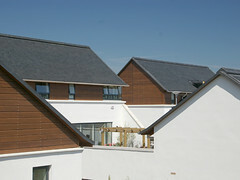 Suburban elements are 2 storey detached houses. 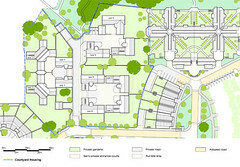 In general the strategy for the development of the site is to place the urban larger elements in the centre at a distance from the sensitive boundaries to east and west. 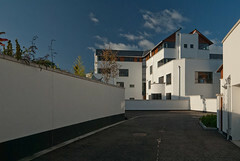 The entrance of the site is marked by the gesture of an octagonal courtyard of two storey terraced houses. 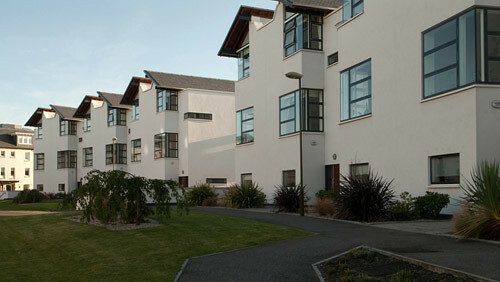 This leads via a walled main road to the central crescent, which is developed by Bryant Homes to the east and AMA in two sections to the west. 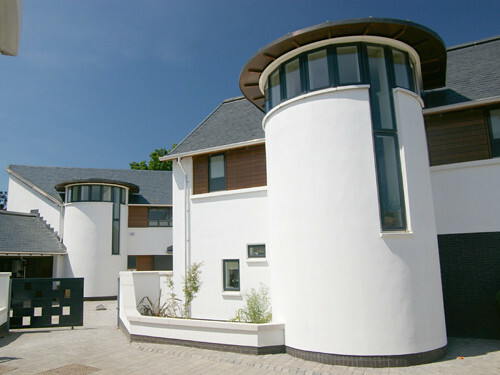 The crescent is in a tradition of crescents found in many locations in Edinburgh, in particular at the west end of the New Town complete with a "mews lane" to the rear servicing garages for each house. 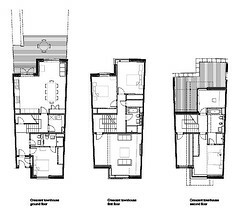 The AMA crescent of town houses has a split section, with each house marked by a one and a half storey window to the living room facing the front and topped by a master bedroom under a monopitch roof. The pattern of monopitch roofs forms a distinctive skyline and each house combines with its neighbour to give the impression of a single building under a split pediment which then links to the next house and so on. To the rear, gardens extend out over the garages which are accessed from sunken lanes. 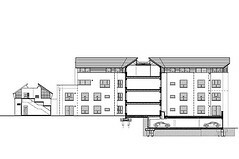 The crescent is the organiser for the traffic on the site, and is terminated at its ends by the flatted developments for AMA and Bryant. 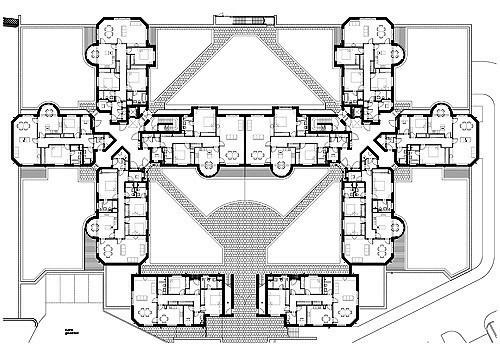 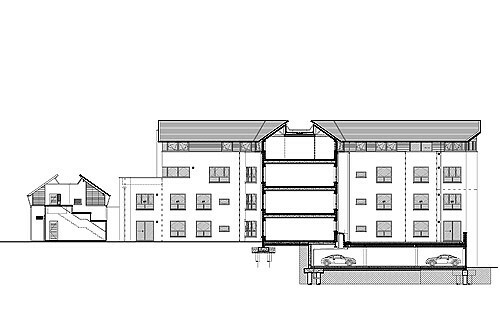 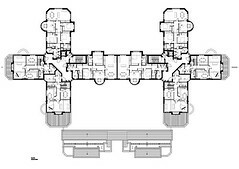 The AMA development consists of two adjacent cruciforms of flats around two central internal hallways. 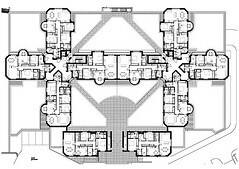 These hallways are a stepped terrace design and are accessed by lift and fire escape staircase, which continue below ground floor level to an underground car park which is constructed along the northern perimeter of the site utilizing the natural fall in the ground levels. 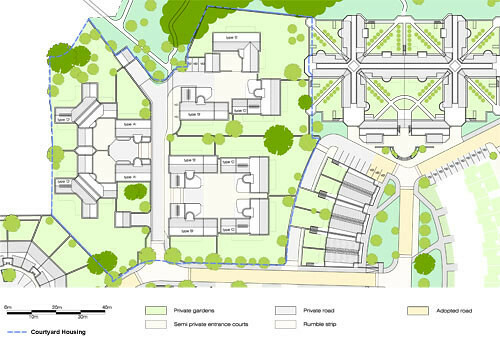 The strategy of the double cruciform taken together with perimeter walling gives the flats a pattern of walled gardens with four smaller square gardens in each corner and two large gardens in the centre to front and back. The small corner walled gardens are terminated at their corners by garden gazebos, whilst the western garden continues out into the landscape over the archeologically reserved area. 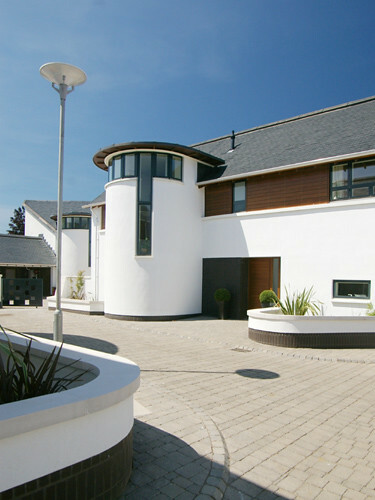 The front of the development the eastern walled garden is completed by the construction of two "gatehouses", each consisting of a ground floor and first floor flat, with their roof continuing across the main entrance. 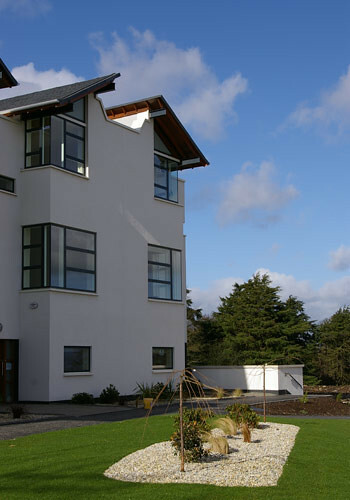 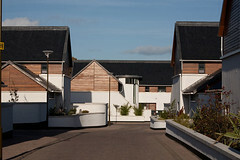 All flats are organised with external terraces and all the first floor flats also connect via external staircases to their adjacent walled gardens. The roof is a double monopitch arrangement with a central flat roof section and inclined roof glazing giving top light into all the major rooms of the top floor flats. 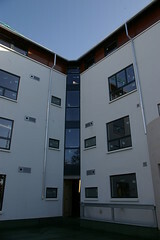 In addition to the 28 flats in the development there are also four maisonettes at second floor level on the east, west and southern arms of the cruciforms. 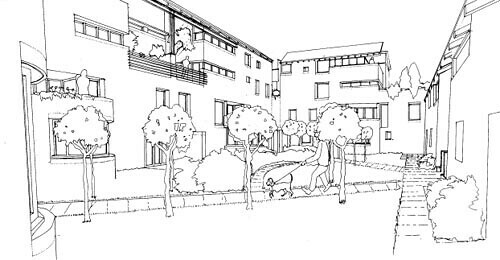 The footprint of the maisonettes does not extend to the extremity of the cruciform arms and thereby offers the possibility of extensive roof top gardens for these units. This has the effect of both greening the entire development and also reducing its visual impact and massing in the vicinity of the adjacent suburban housing. The suburban housing on the site is divided into four sections, the north west and north east quadrants are developed by AMA and the south west and south east are developed by Bryant Homes. 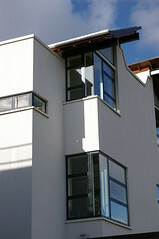 The AMA sections consist of variations of five house types. 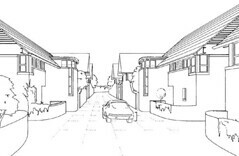 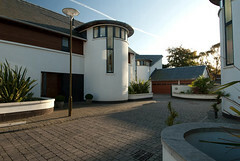 The strategy for the AMA suburban housing development is to reverse the pattern of the normal UK housing estate, which consists of individual houses surrounded by front, back and side gardens; (in other words object buildings surrounded by space) which are then arranged around suburban roads. 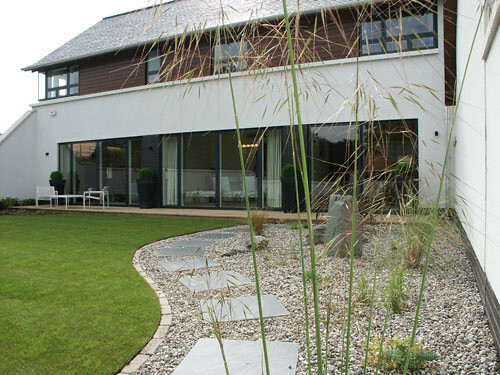 At Cramond we have taken our lead from traditional developments such as the Grange or Murrayfield, where roads are bounded by continuous garden walls, and frequently there is an ambiguity between garden wall and building. At Cramond we have abolished the front garden for each house type, preferring to put all the available space into a private walled garden to the rear. In addition, all the roads are lined with garden walls, each of which engage directly with the walls of the individual houses creating this ambiguity between wall and house. 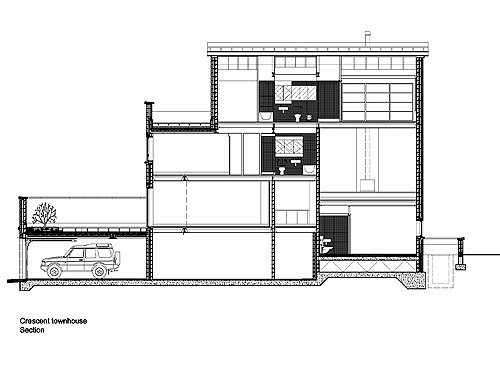 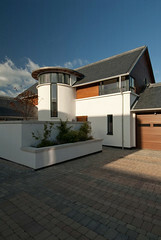 Houses are then combined in various formats to form recognisable thresholds and places. 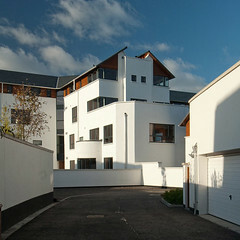 For example the smaller of the houses are paired to form "gatehouses" to larger house types. 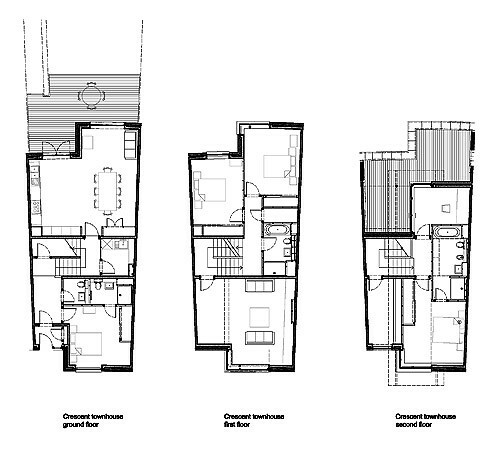 L shaped house are combined to form private courtyards approached through a relatively narrow threshold. 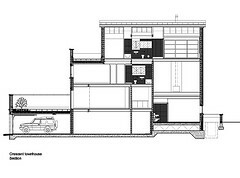 In this way we hope that the experience of suburban housing will be transformed with recognisable space making and thresholds. 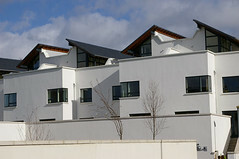 The five houses each have common features and materials. These are a low eaves height giving an impression of a 1.5 storey house, an identical staircase tower which also marks the entrance and in the case of larger house types, an entrance courtyard of gravel or setts for parking and visitor parking. 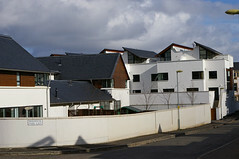 The construction cost of AMA's part of the development is £14 million, work on site of the first phase commenced in 2003 and was completed in Spring 2007. 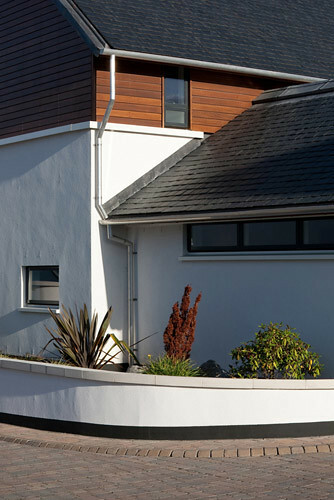 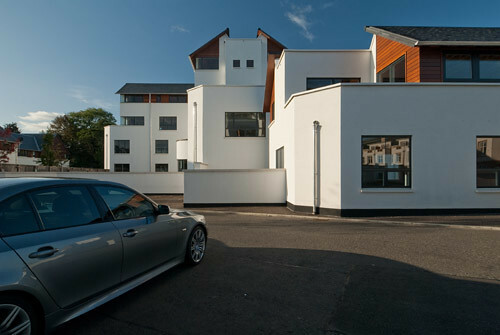 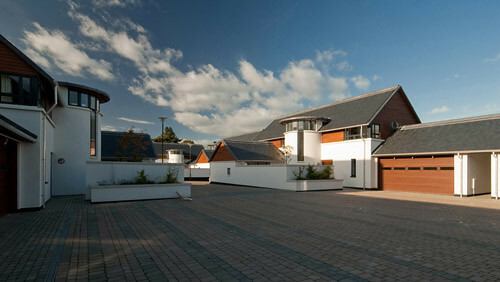 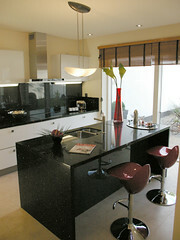 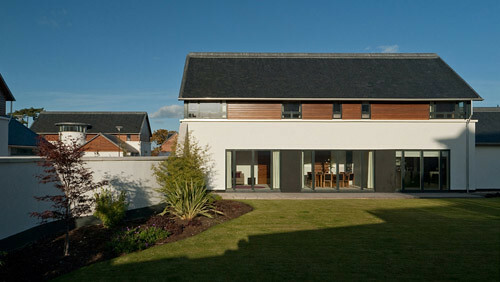 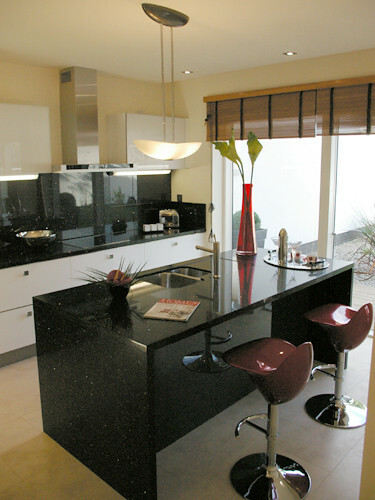 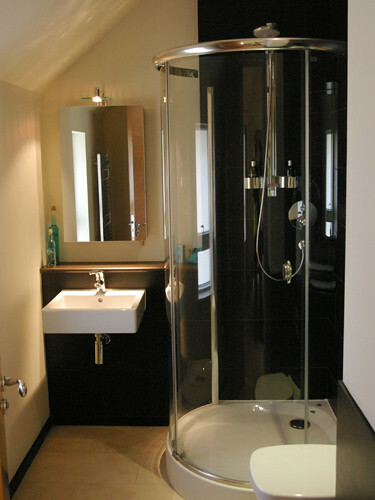 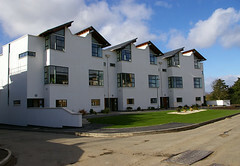 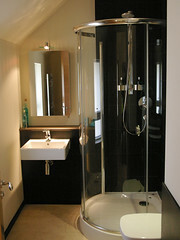 AMA (New Town) Ltd then commissioned us to complete the last section of their prestigious housing project at Cramond. An octagon of terraced housing forms a gateway to the development which features courtyards, apartments and individual houses - many arranged around shared courtyards. 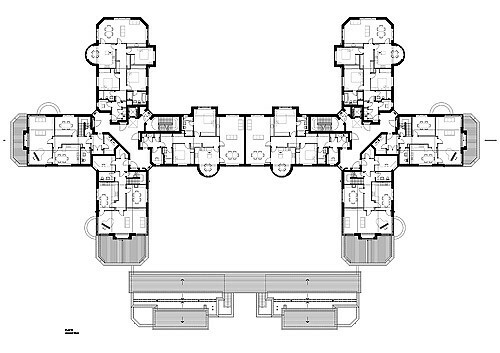 This last section is expected to be completed in May 2016.